Since the early 1990s, the transfer of educational services is gaining importance. In particular, England, Australia, and the U.S. have placed international study programs on the international education market, but also German universities are increasingly involved in international education exports. Technische Universität Berlin (TU Berlin) has always been committed to cooperation with foreign universities. It is also interested in expanding and increasing cooperation with foreign partners, especially partnerships that bolster its expertise in teaching and research. Most projects can be classified as non-profit, whereby fees and third-party funds cover running costs. To capitalize on the unique character of the MENA region – including arid climate, high levels of urbanization and great potential for solar energy generation – there is a great demand for highly skilled professionals in the engineering field. 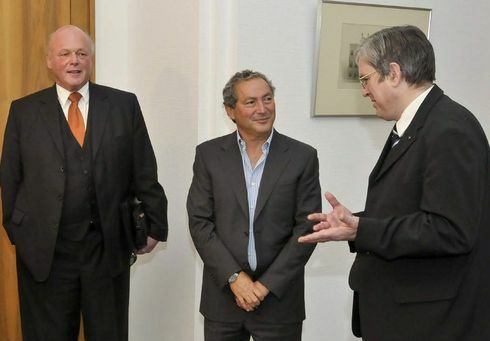 In 2006, Samih Sawiris, former TU Berlin graduate and current Chairman of Orascom Development Holding AG, discussed with then TU Berlin President Dr. Kurt Kutzler the prospect of ​​a "science branch" of TU Berlin in Egypt. Classes at TU Berlin Campus El Gouna began on 28 October 2012, offering three Master degree programs in Energy Engineering, Urban Development, and Water Engineering. The programs are attended by students from Egypt and other countries. Mr. Samih Sawiris in the middle of the two former TU Presidents Prof. Dr. Jörg Steinbach (right side) and Prof. Dr. Kurt Kutzler.